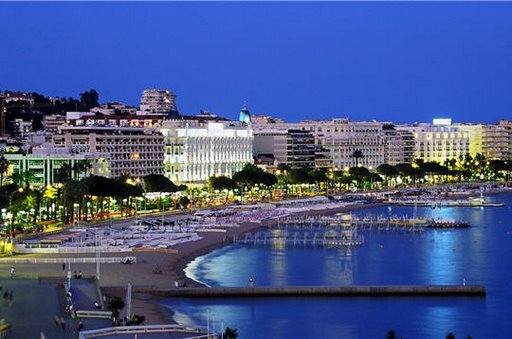 Cannes must be one of the most famous cities in France besides Paris. Located on the Mediterranean coast, along with Nice it makes up a part of what is known as the French Riviera. I was lucky enough to stay with my friends in a beautiful villas through this site. Given the region’s beautiful climate, the bay and the surrounding countryside Cannes has been a popular destination for tourists and holidaymakers for many years. Recently however, the city has become best known for its film festival which attracts everyone who is anyone in the movie industry, not just from Hollywood but throughout Europe, Asia, Bollywood and these days even Nollywood, the burgeoning yet already thriving film industry in Nigeria. Much of what attracts people to Cannes comes in the form of conferences and festivals. Of course there’s the film festival, later in the year there’s the TV festival, there are corporate conferences and yachting regatta. You could be forgiven for thinking that’s all Cannes is about. But there is much more to the town than that. Cannes has golf links, beautiful white sandy beaches, a young and trendy population who enjoy clubbing, yachting, inland the countryside is simply beautiful and Monaco is nearby, just a short boatride away. Because Cannes is a relatively new destination as far as tourism is concerned (although the town’s history goes back centuries its popularity only really took off in the 19 th century) there isn’t a grand tradition of art and culture that you often find in many other French cities. This doesn’t mean that art and culture have no place, quite the reverse, the beauty of Cannes’ art, music and theatre communities are unpretentious, forward facing and innovative, welcoming the new influences that flow in thanks to the many festivals and events that happen in the city all year around. Proving that Cannes has its feet in both the modern and ancient world the city’s main museums is the Musee de la Castre, not only does it keep many relics and artefacts of the city it is also home to objects from the Himalayas, the Pacific rim and Inuit traditions. Cannes’ Musee de la Mere is an old prison which sits atop steep white cliffs. The building itself is a historical monument and it homes the Cell of the Iron Mask where the prisoner who inspired Dumas’ classic novel was held for over a decade. The museum also holds relics of Roman and Saracen occupations and an open air area where temporary exhibitions are shown for much of the year. For those interested in modern art La Malmasison and L’ Espace Miramar are important places to visit. Espace Miramar hosts several temporary exhibitions per year, these exhibits mostly concentrate on photography and the plastic arts while La Malmaison hosts three exhibitions per year by some of the biggest names in modern art. The intimate character of La Malmaison makes it a popular place for both artists and viewers as it is possible to get a real feel for the works on display. While modernism and the contemporary are all very important in Cannes that doesn’t mean that it is ever possible to forget where you are: Provence. And Provencal cuisine is a Mediterranean cuisine which also incorporates traditional French cookery. While most of French cuisine is based on butter and meat Provencal cuisine has a Mediterranean touch including anchovies among other sea fish and olive oil rather than butter. Then of course there are the regional breads, wines and cheeses, all of which make any stay in Cannes not long enough.